Mini print of Coffee, 1915, by Pierre Bonnard. Bonnard here captures a moment in time at the kitchen table in his home. 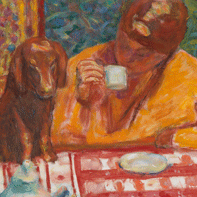 The perspective of the painting implies that Bonnard himself is seated at the table, looking towards his wife, Marthe, sipping coffee, and their daschund, who sits next to her with its paws on the table. This casual scene is carefully composed; Bonnard made several preparatory sketches before making the final painting.